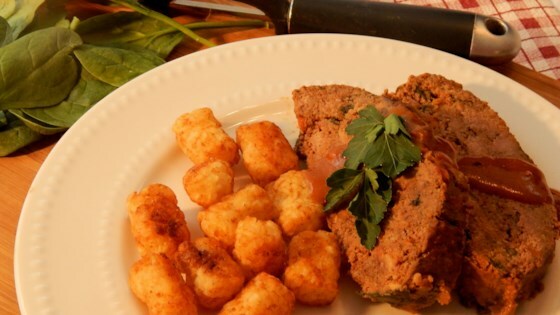 "Delicious, relatively healthy meatloaf that can be left to cook all day or for a few hours. You can use ground turkey, and or add diced vegetables, such as carrots, bell peppers and zucchini, for an even healthier version...or chiles for a nice spicy kick. Makes great leftovers for sandwiches." Cut 2 long strips of aluminum foil, long enough to sit in your slow cooker and hang over the sides to use as handles for removing the cooked meatloaf. Place the strips so they form a cross in the bottom of the slow cooker, making sure the ends are long enough to gather on top of the loaf. Heat olive oil in a skillet over medium heat. Add onion and garlic; cook until onion is tender, about 5 minutes. Season with pepper and salt; transfer to a bowl. Add beef, crumbled bread, bread crumbs, egg, yogurt, 1 1/2 tablespoons Worcestershire sauce, and 1/2 the tomato soup. Mix well; if too dry, add milk 1 tablespoon at a time until moist but not soggy. Shape mixture into a large, round loaf about 1/2-inch narrower than your slow cooker. Place loaf into the slow cooker on top of the aluminum foil strips. Mix the remaining tomato soup and Worcestershire sauce, water, brown sugar, and mustard together in a bowl; pour over meatloaf. Cover slow cooker and cook on Low for 8 to 9 hours; internal temperature should reach at least 160 degrees F (71 degrees C). Remove meatloaf with the aluminum foil handles. Cut into slices.